What's the Minor bebop scale? How To Build The Dorian Bebop Scale? 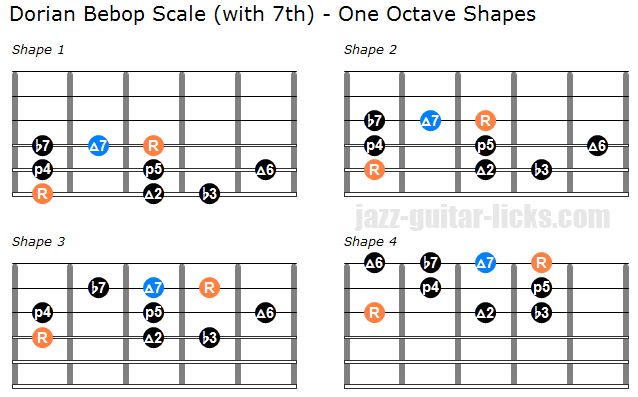 The Dorian bebop scale also known as minor bebop scale, is an eight notes scale (octatonic). It is commonly used in bebop. This scale like all the octatonic scales (except the symmetric scales) contains a chromaticism, an additional note between the minor third (b3) and the fourth (4). The Dorian bebop scale is built the same as the Dorian mode including a major third (3) between the minor third (b3) and the fourth (4th). The Dorian bebop scale is a minor type scale so it can be used over minor 7th chords. It's an interesting alternative for those who want to increase their musical language. Most of the time jazz guitar players used the Dorian mode, minor pentatonic scales or some arpeggios to play over a minor seventh chord. Playing the Dorian bebop scale open up new horizons. You can see in the example below that the D Dorian bebop scale contains a minor third (F), a chromatic passing tone (F#) and a minor seventh (C). Here is quick comparison between the Dorian mode and the Dorian bebop scale. You can see that there is no major third (passing tone) in the Dorian mode. If you look closer, you will see that the Dorian bebop scale is the fifth mode of the Mixolydian scale (aka dominante bebop), so it has the same notes. The same passing tone is used for the Dorian bebop and Mixolydian bebop scale. It means that it is possible to interchange scales and lines. For example, in a II-V sequence, you can use the same bebop scale (Dorian of Mixolydian) both for the iim7 chord and the V7 chord. The Dorian bebop scale has an extra note between the b3 and the 4th (F#) whereas the Mixolydian bebop scale has the same extra note between the b7 and the root. There are two versions of this scale, one with a passing tone (3) between the b3 and the 4th and one with a passing tone (7) between the b7 and the root, this one has the same intervals as the dominant bebop scale. How To Play The Dorian Bebop Scale On Guitar? Here is a first Dorian bebop guitar diagram. This is the verision with an additional major third (3) between the minor third (b3) and the fourth (4). The notes of each diagram a within the space of one octave. To hear this scale correctly, it is preferable to play these shapes starting with the root (R). Then you you can try to play them starting from the chord tones (R - b3 - 5 - b7). Playing the corresponding chord after or before is a nice way to bring scales and chords together. These two diagrams have notes within the space of two octaves. 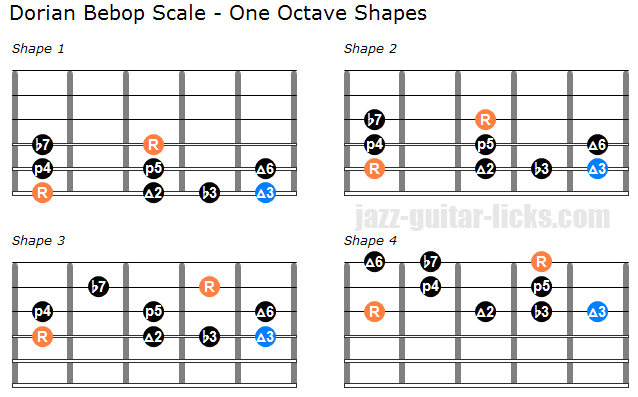 As explained previously, there are two types of Dorian bebop scales. Here are the guitar shapes corresponding to the second type, the one with a major 7th between the minor seventh (b7) and the root (R). These two guitar shapes show how to play the Dorian bebop scale (with the major 7th) within two octaves. You have to play these shapes in twelve keys and try experiment your own fingerings. 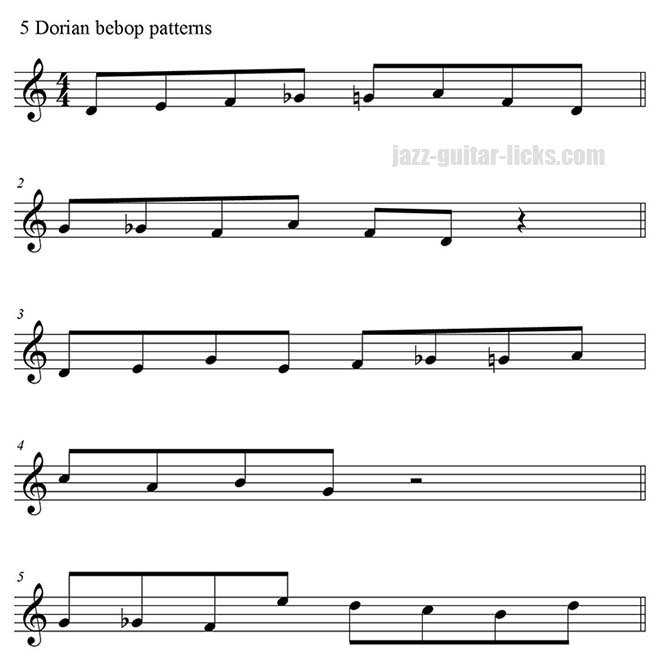 Check out and play these five easy Dorian bebop patterns in D minor.